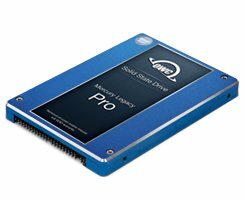 SDD stands for ‘Solid State Drive.’ SSD drives are the same shape and size as a traditional drive. The difference is that an SSD drive uses RAM chips instead of a spinning hard disk to store information. This makes it much, much faster. SSD drives are now reasonably cheap. I’d suggest you upgrade your entire hard drive to SSD. There have been issues in the past with SSD drives and there have been some brands not working with OSX, so make sure you get a good one. The first place I would recommend is macsales.com. I have one of their OWC Mercury SSD drives in 2 of my laptops. They have a screen where you choose your macintosh computer, and it tells you which SSD drive is compatible. 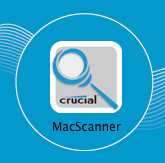 Just click here and you will be asked what mac you have, follow the prompts. 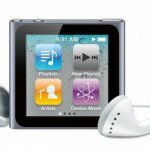 (I have signed up to be an affiliate of Macsales so I get a commission if you use these links.) Last check a 1TB drive was under $400. When I first wrote this article a 480G SSD drive was $1579.99! The second place I would recommend is crucial.com. If you do get a Crucial SSD you can go for the MX or BX series. I’ve also got a Samsung EVO drive running in a 2012 Macbook pro and it’s running fine. Buy a new SSD not a second hand one. They do degrade over time. 2. Temporarily connect the new SSD Drive to your Mac. The external drive enclosures for normal hard disks should also work with an SSD. Plug the SSD into the enclosure, and then into the Mac, and it should appear on the desktop as an ‘Untitled’ drive. 3. Format the SSD Drive using disk utility. 4. Copy everything onto the new boot drive. Now you need to copy your entire drive onto your SSD drive. You can’t do this by hand – there are hidden files that need to be copied, so need to make what is called a ‘Clone.’ Apple’s built-in Disk Utility won’t do this so you will need an app like Carbon Copy Cloner or Super Duper. Click ‘Clone’ and your boot disk will be created on the SSD disk. The other option is to use Super Duper. There’s a free version that will enable to clone your drive. Select ‘Backup -all files’ to make a clone. Making a clone of you drive can take a long time – hours – so take a break! 5. Reboot from the new SSD boot drive. 6. Swap the internal Hard disk for the SSD drive. Now that it’s working it’s time to get rid of your old hard drive and physically replace it with the working SSD. The difficulty of this varies according to what kind of a Macintosh computer you have. I’d check out ifixit.com for the best instructions according to your mac model. Difficulty: easy – 30 seconds. Difficulty: moderate – 1 hour. For a Macbook or Macbook Pro can replace the internal optical drive with your old Hard Drive or order a large SSD drive and replace your old hard drive with it. You can find instructions here. Difficulty: hard – 1/2 hr. For a new aluminium mac mini you will need to replace one of the internal drives. This involves pulling out the fan and motherboard to get the new SSD drive in. You can get the old hard disk out without pulling out the motherboard but the SSD drives are actually ever so slightly thicker and more uniform in shape so the motherboard needs to come out to manoeuvre the SSD drive in place. There’s easy to follow instructions here at mac fixit. It’s quite complex to pull the iMac apart and you need a vacuum clamp to pull the glass screen off. This is easier than it sounds, but you still need to but the suction caps to do it. It requires some mechanical skill. There are good instructions here and crucial have their own guide here. 7. Check if you need to Enable TRIM. Some Hard Drives do not come with TRIM support and so you need to download this TRIM Enabler app and run it. This will enable OS X built in TRIM support which keeps your SSD drive lean and clean. 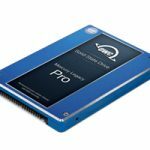 The SSD I recommend above (Crucial M4) does not need TRIM support (read this article for more information). You can turn it on anyway no problems. The OWC Mercury SSD drives do not need TRIM enabled either. STOP PRESS: There are new reports that TRIM enabler does not work with Yosemite. Read this article for more information. If you already have a Time Machine backup, when you change Hard Drives it starts all over again and won’t recognise the old Time Machine backup. Read this post for info on how to get around this. Also here is another very good article on this. I also just found this GREAT article on keeping Time Machine working when you change the Hard Drive. If you don’t have a Time Machine backup now is a great time to start! You can use your old Internal Drive as a backup drive. 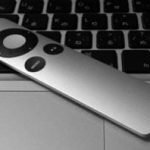 What is TRIM and do I need to turn it on in OS X? What’s the best SSD drive for a Mac and how do I install it? 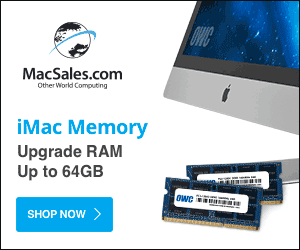 The best place to buy RAM for your macbook or imac. How to use 2 monitors on your mac 7 ways to make your Mac boot faster. Just a note of thanks and a word of warning to others. In Carbon Copy, I deselected the *entire* Users folder. Somehow, it still copied over my users, but I could not sign into iCloud (from System Preferences) or iTunes Store (from iTunes). I cloned again, this time selected the Users Folder but deselecting only my primary and secondary users. This worked. Thanks again for such well-written instructions. 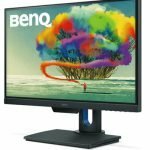 Great post, but I’m still having issues getting my computer to boot from the SSD.. I think. I bought a Samsung EVO 850 SSD (and enclosure) and connected it via USB 3.0, as opposed to opening up my mac mini 2014. The drive is all set up after running Carbon Copier and it’s even found as a bootable drive in “Startup Disk”. However, after booting up, I look at “About this Mac”, it still lists my original HDD as the boot disk. Is this right? I’m 98% sure that my computer booted off of the SSD, is there another way that I can verify that everything worked? The boot disk has a grey icon on the desktop while the others are orange. The system folder on the boot disk has a different icon – it has a dark blue X, the non boot disk doesn’t. In ‘Disk Utility’ you can’t ‘unmount’ the boot disk. In ‘Disk Utility’ you can only repair the boot disk. Listen to the non SSD hard disk during boot and make sure it’s not making noises! Thanks so much for this article. Worked like a charm. MBP 6,1 boots up and runs so much better now. 1) Is there away to move the “User folder” in Step 6 over to the new SSD? 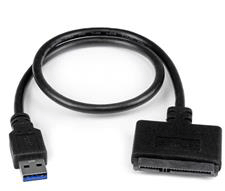 Would this make any difference in the way the computer starts up? 2) Would putting all my music and movies on the SSD make iTunes and other programs run any faster? Again, thanks for this article. Really helped me in this process. You can just clone your entire Hard Disk over to the SSD, yes that will make everything run faster. In fact this is what I do on my laptop – with a 240G SSD drive. It’s just that big SSD drives are expensive although they are getting cheaper. It’s better to have it all off the SSD, I just do it this way with the user folder on the old HD as a cheaper option. I only read your very interesting article AFTER (on December 29) I built in a 240 GB SSD in my mid 2011 iMac and made my two drives into a fusion drive. My Mac boots very fast now (about 20 seconds) BUT often used programs don’t seem to go to the SSD. Do I simply have to wait or could anything be wrong? As I have CCC I am now thinking of “defusioning” my fusion drive. Do you have any idea’s about this? Thanks a lot & greetings from the Netherlands. I’ve never looked into a fusion drive sorry. You would think if the fusion drive is meant to put commonly used software on the SSD, then your often used programs should be on the SSD, but I’m not sure how fusion drive works exactly. I run my two separately, not as a fusion drive. So I can move applications onto my SSD if I want them to launch quickly or I can leave them on my old hard drive if I use them less regularly or don’t care if they take a while to boot up. Thumbs up on the simplest yet most effective way of doing this hdd to ssd move. I did all your steps and it works like a charm on my old 2009 imac running el cap. Question though, what happen when software update is due? Do i need to run ccc everytime osx or an app is upgraded? Software update all works as normal. OS X updates itself onto the SSD boot drive, as do any apps form the app store. I’ve been running this setup for 3 years now. Wonderfully written instructions, Wayne. Thanks! One question: I’ve gone ahead and cloned the system, apps and user file to the new SSD/boot drive. Is it then okay to erase the old boot disk? Yes… but you should always have a backup! So you did Step 6 exactly as above? Worked great for me as well. CCC lets you clone with the trial version but I might purchase anyway. Runs great. I did notice a warning of a complication in OSX when I changed the User directory back to the old HD that said you might not be able to log in after changing the directory, exactly what Jim Dyer experienced. But it worked ok for me. I would be curious how to avoid that. Thanks for a great solution! Bought a kit from OWC to add an SSD to my mid 2010 iMac 27″. Cloned my original 1TB drive to a 2TB drive and installed that at the same time as my SSD. With the OWC install kit and these directions, everything went super smooth and worked perfectly. Thanks for the great directions! If anyone wants to know step-by-step what I did, reply and I will post. I have to admit I`m a bit of a novice when it comes to SSD. How to I get the Mac OS onto the SSD? That`s all done in Step 4? Or do I need to first install the OS on the SSD via a memory stick and then follow your instructions to get all the rest copied over? What should be done with System Folder on source disc after moving to boot drive? Delete? I had problems once before with source disc failure. TM didn’t work properly when trying to install backup to new hard drive. Also source disc with fall behind regular system updates. Yes, you can delete it, or leave it as a bootable backup. I would keep it till you are confident the new system is working and backed up and then delete it. I’ve run into some trouble. I’ve followed these exact steps. My Macbook Pro restarted when I changed the home directory. The problem is that when i tried to log in to my account (the only one that’s on there), I get an error message. It says that due to some kind of error they can’t log me in. The error didn’t even get specified. Any tips or help on how to solve this problem? Hello. Thanks for this! I just ordered from OWC and am exited to try adding a boot only ssd drive and take out my old optical drive. Going to follow your instructions and use Carbon Copy Cloner to make it all work. Question. Future when it comes time for monthly backups. I have always used Super Duper. Will I now need to make bootable backups of both of the drives, the old HD and the new boot SSD? Yes you will need to back them both up. Sorry one more question! Looks like My Carbon CC expired. 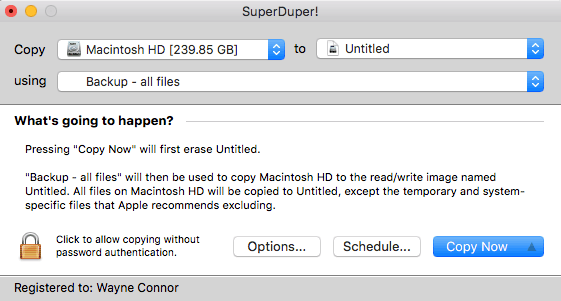 Do you know now to do step 4 above to just “copy your system folder and applications” with Super Duper instead? Much appreciated! It’s a lot easier in Carbon Copy Cloner. Alls set and working properly! Thanks again! (Some pathing fixes with Lightroom and other old home folder updates in a few other programs etc… no big deal.) Question, for example when the day comes to upgrade to a new machine and SSD prices are reasonable for 3tb :) can you explain the process to combine back to a single drive? 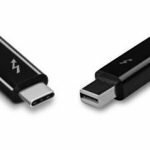 I am grateful for the information in this post and used it to successfully switch to an SSD drive yesterday, which has been a revelation in the newfound speed. It’s now clear my old Mac Pro is still a capable machine but the SATA drive is massively responsible for the delays and spinning ball. My only observation for the benefit of others reading this is that the cost of SSD drives have come down significantly since this article was first written, so I would suggest buying an SSD that is big enough to contain the full user data and the OS etc in one place if you can stretch that far. That should be fast and easy to manage. I purchased a 256 gig Samsung PCI SSD that is lightening fast with read speeds of almost 2000mb/s. 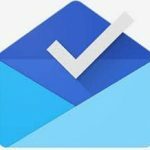 Most Apps now open in the blink of an eye and navigating around the finder is now instant, however anything requiring access to user data left on the old SATA like email messages is still dog slow when accessing that information. Given the amount of data in question I may end up buying a 500 gig SSD purely for user data. Hopefully that will then keep me going for a few more years without needing a new computer. Thanks Ashley, yes I need to update this article. I just replaced my drive with a 1TB SSD and have everything on one drive. They are certainly more affordable now! Thank you Wayne. One point I struggled with after the install was whether or not to enable Trim, which I eventually did via the terminal in El Capitan with “sudo trimforce enable” but I had to search high and low to find information about whether this was required for my Samsung SM951. I can’t help feeling these drives should arrive with specific information. One major advantage not often mentioned about using an SSD is the dramatic reduction in noise levels. The constant disk activity on my SATA drive with not much real activity becomes pretty tedious when you are working all day long. A second bigger SSD of the same kind for the user data would have this machine running like a thoroughbred. Yes, it’s drive specific whether you need to enable TRIM or not, and I agree the manufacturers should be clearer with instructions on TRIM! Thanks for the gr8 guide! I have a new Imac 21.5, late2015, 8gb, 2.8 Ghz and I wish to have a faster Boot / Apps and so on. Can I use your method with an SSD Card via the SDXC Card on the back of the Mac? Hi thanks so much for this comprehensive tutorial! I did have a question though. I added a ssd to my iMac and transferred all my files over to it. I left the user files on my old drive. I also set up the startup up drive to the ssd. But it doesn’t seem to be noticeably faster. I’m worried I did something wrong. Would it help at all to split the drives and have one open all the apps and one startup? Or even have my larger apps on the ssd and all the others on the old one? I use large programs like photoshop so I need fast processing speeds. It should be very noticeably faster to boot and run apps. It might not be booting of the SDD drive. It will open a window from the current boot drive. Yes it is booting from the new drive. I actually think everything is slower, even the boot up time! But…when I open Lightroom I open my Activity monitor and see a significant load on my CPU. But as I use the app, there’s spikes of load on the SSD. Is my processor going out? Yes create a bootable USB installer. 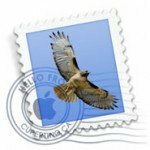 I just wanted to confirm – If I have an old Mac (MACbook pro – 17″ from mid 2009), does the OS-X El Capitan work, it’s compatible with old computers? Thanks! Hi, does this applicable to external SSD? i wasnt able to select the external SSD drive as start up disk, do i click target disk mode instead? Is step 6 applicable to external ssd too? Your description worked perfect for me! 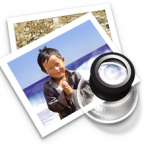 I am just wondering now, how to delete OSX and the apps from the “old” HHD in order to make more room for pictures, etc. You can delete everything from the “System” folder on your ‘old’ HDD, but it doesn’t hurt to keep and there as a backup. Just one fairly substantial correction. While an SSD may contain some RAM as a buffer, that’s not what it uses to permanently store information. It uses a non-volatile memory. That can theoretically be an EEPROM, but more often NAND flash. Intel and Micron have a new form of non-volatile memory that they call “3D XPoint” (cross-point). Intel even has some modules out on the market now that are supposed to serve as some sort of link between RAM and a flash memory based SSD. Wayne, is anyone still paying attention to this article? I’m having trouble with the same thing Louis has mentioned above, but no one has answered – I’ve been accessing the data/preferences from the old User folder on the original boot drive – having to restart over and over (I put in the ssd so the machine would be quieter in my voiceover recording studio, and have to eject the original boot drive when recording so only the ssd is being used). It worked Ok, but now it has given me the “can’t log you in because of an error” thing. It doesn’t say why, and I can’t find a way around it, except to log in as a guest… and that’s going way back to beyond zero operationally. Do you have a path around this issue? Or else give Apple a call on their tech support line. Is your SSD drive big enough so that all your files can fit onto it. Maybe run fully off the SSD? Helpful topics. Any advice for adding an SSD to a Mac Pro when there’s absolutely no chance of fitting all the stuff on my current boot drive (roughly 2.7+TB) onto an SSD. Thoughts about selectively moving? Use ‘Disk Inventory’ to see what’s taking up most space? Hope you’ve been well. This weekend I’m switching back from 2 drives since the price of SSDs have dropped. Can you please explain a step by step process to combine back to a single drive? Was thinking of cloning the boot to the new drive then using migration assistant to bring over the home folder… that is if it will boot without a home folder. :) Any suggestions? Thanks! That will work, but it’s easier just to Clone the boot drive then use carbon copy cloner or super duper to copy the user folder across. It’s the exact reverse of the process above. I just found this thread and wanted to ask a question if I may. I bought a brand new iMac in March 2018, and from the offset, it was just super slow for most application launches, even just the address book. I had Apple Care look into it, the store I bought it did too, all telling me that there seems to be no hardware problem. We reinstalled the OSX a few times, etc. Now, I took it to a general tech expert who has already worked on my PCs, and he suggests putting in an SSD drive. I bet he is right, things will be definitely better with speed, and seeing your thread confirms this. However, I just feel like it’s crazy to have to do this with a NEW computer. Have you seen this situation before? On top of everything, by doing this I would nullify the Apple warranty. For the price, this seems like a crazy situation. i would love to know what you think. Thanks! Unfortunately traditional hard drives are rather slow especially with the larger file sizes that are being used in computers today. Is very hard to make an assessment from what you describe but in my opinion buying a new computer today that does not have an SSD in it is a mistake. 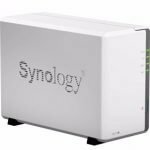 In fact you will notice what that with the latest Mac minis Apple have even taken the next step – you cannot even buy a normal SSD only a high-speed PCIe one. That really makes a traditional spinning hard drive 3 or even 4 generations old now! The speed differences are as follows (Slowest on left). It does feel crazy to be doing this in a new computer. But thankfully you are better off buying an iMac with a spinning hard drive and then upgrading to an SSD yourself because apple SSD is a way overpriced. Check out owc or crucial. This is an excellent article, thanks! Is it necessary to remove the SATA drive? I’ve got a 2014 mac mini and really don’t want to go through that hassle if its not necessary. If you have a Mac mini that has enough room for two hard drives then yes you can leave the existing one in there! Thank you for this! I was blanching at the thought of buying a new Macbook Pro to replace my 2012 model. This post is so clear, I am sure I can follow these steps. So used your link to buy a new hard drive and enclosure.